Fantastic Review of In Character! Opera News‘ Matthew Sigman recently posted this fantastic review of In Character: Opera Portraiture! Picture books get no respect, derided, often rightfully, as decorative objects unworthy of literary consideration. In the opera world, such contempt can be justifiable: frequently assembled for notable company anniversaries, such memory books often offer dry prose, static production tableaux and glam portraits of divas in celebrated roles. John F. Martin’s In Character defies such stereotypes. With its prose confined to the opening pages — Amy Tan’s spare foreword is elegant, Martin’s explanation of process is essential, the rest is noise — and captions smartly placed as a thumbnail index at the end, the result is a rare alchemy of the performing arts, the fine arts and the graphic arts. Martin began his association with San Francisco Opera as a supernumerary and managed to set up a closest studio in the War Memorial Opera House just off the canteen. He coaxed performers from the wings to sit for a moment in full regalia and character, their emotions engaged. you can smell the sweat of jealousy on Dmitri Hvorstovsky’s chest as Count di Luna in Il Trovatore. You avert your eyes from Natalie Dessay’s Lucia, so upsetting is her frail glance of madness. Qian Yi, as Precious Auntie in The Bonesetter’s Daughter, floats as if to heaven. But it’s not only stars that shine bright in In Character. Yes, we see boldface heroes, villains and ingenues, but we also see clergy and townspeople and servants and social outcasts and a “fantasia” of freaks. We see wordless gaiety and fortitude, reflections of sorrow and pride, a child bereft of soul, captured as if by Diane Arbus. We also see the masterful skills of today’s leading costume designers in impeccable detail: Constance Hoffman’s terrifying harlequins for Rigoletto, François Barbeau’s bawdy dancers for The Rake’s Progress, Laurent Pelly’s snooty aristocratic ladies forLa Fille du Régiment. Curtain Call host Charles Sepos chats with John Martin about his new book In Character: Opera Portraiture. In Character: Opera Portraiture memorably captures operatic performers away from the audience but fully inhabiting their roles. It showcases the work of John F. Martin, who for years set up a portable studio in the basement of the San Francisco Opera and photographed the players – in costume and full makeup – right before or after they took the stage. The subjects range from nonsinging supernumeraries through chorus members and comprimarii to opera’s greatest stars, such as Anna Netrebko, Natalie Dessay, Deborah Voigt, Juan Diego Flórez, and Dmitri Hvorostovsky. Their roles run the gamut of opera personalities: heroes and heroines, villains and outcasts, royalty and common folk, Biblical figures and creatures of myth. Facing Martin’s camera, each artist projects the essence of his or her character, however great or small the part. The book also features a foreword by author Amy Tan; a preface by David Gockley, general director of the San Francisco Opera; essays on opera behind the scenes, the vital role of costumes, and the transformation of singers into characters; and an interview with world-renowned soprano Danielle de Niese. A collection unlike any other, In Character will have broad appeal-to opera and theater buffs, costume and fashion aficionados, and anyone who appreciates fine art photography. 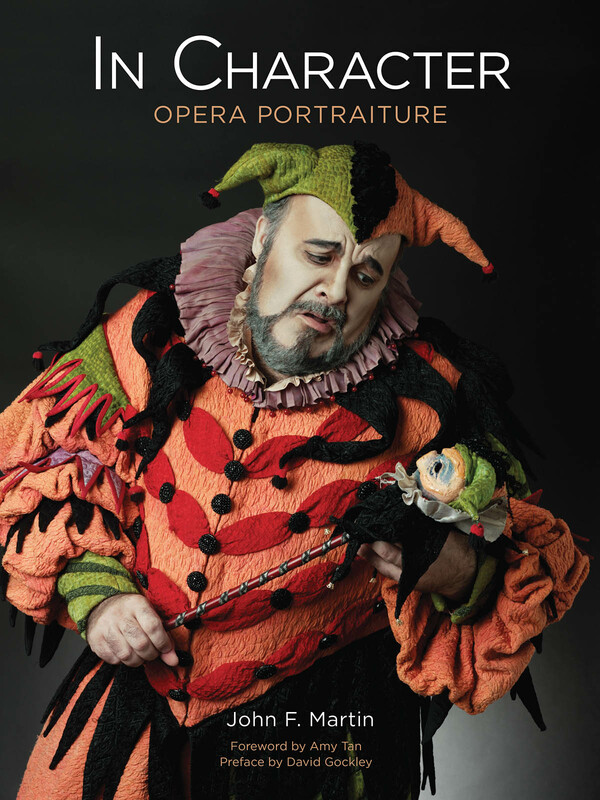 In Character: Opera Portraiture, available from Amadeus Press 11/04/14, memorably captures operatic performers away from the audience but fully inhabiting their roles. It showcases the work of John F. Martin, who for years set up a portable studio in the basement of the San Francisco Opera and photographed the players – in costume and full makeup – right before or after they took the stage. Their roles run the gamut of opera personalities: heroes and heroines, villains and outcasts, royalty and common folk, Biblical figures and creatures of myth. Facing Martin’s camera, each artist projects the essence of his or her character, however great or small the part. A collection unlike any other, In Character will have broad appeal-to opera and theater buffs, costume and fashion aficionados, and anyone who appreciates fine art photography.